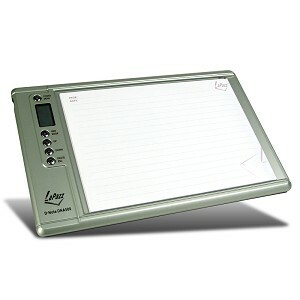 Reduce strain from overwriting and typing with this LaPazz D-Note DNA500 Digital Note Recorder! Forget about the days of taking hand notes and retyping them, the DNA500 instantly captures your hand-written notes, diagrams and drawings from ink pen and regular paper and stores them as digital pages. With a roomy 32 MB of flash memory built-in to the recorder you can store all your important notes and reminders and transfer them later to your computer with the USB 1.1 interface.